A black and white lithograph shows Laura Bridgman guiding her friend Oliver's hand over an open book with raised print as she teaches him to read. Both children's signatures appear at the bottom of the print as further proof of their literacy. Portrait of Oliver Caswell and Laura Bridgman (1844). Lithograph by W. Sharp, 1844, after A. Fisher. Courtesy of the Wellcome Library, London under a Creative Commons License (Wellcome Library no. 16376). In January of 1842, Charles Dickens paid a visit to the Perkins Institute for the Blind, just outside of Boston, MA, as part of his American tour. There he met Laura Bridgman, whom the director of the institute, Samuel Gridley Howe, touted as the first deaf and blind person to be educated. (That person was arguably Julia Brace, who had been educated at the Hartford Asylum for the Deaf and Dumb using sign language.) On his return home, Dickens published an account of his encounter with Bridgman in American Notes for General Circulation, comprised partly of his own reflections on Bridgman, and partly of Howe’s widely reprinted 1838 Annual Report for the Perkins Institute of the Blind, which Dickens literally cut and paste directly into his manuscript. It is strange to watch the faces of the blind, and see how free they are from all concealment of what is passing in their thoughts; observing which, a man with eyes may blush to contemplate the mask he wears. Allowing for one shade of anxious expression which is never absent from their countenances, and the like of which we may readily detect in our own faces if we try to feel our way in the dark, every idea, as it rises within them, is expressed with the lightning’s speed, and nature’s truth. If the company at a rout, or drawing –room at court, could only for one time be as unconscious of the eyes upon them as blind men and women are, what secrets would come out, and what a worker of hypocrisy this sight, the loss of which we so much pity, would appear to be! The thought occurred to me as I sat down in another room, before a girl, blind, deaf, and dumb; destitute of smell; and nearly so, of taste: before a fair young creature with every human faculty, and hope, and power of goodness and affection, inclosed within her delicate frame, and but one outward sense—the sense of touch. There she was, before me; built up, as it were, in a marble cell, impervious to any ray of light, or particle of sound; with her poor white hand peeing through a chink in the wall, beckoning to some good man for help, that an Immortal soul might be awakened. Long before I looked upon her, the help had come. Her face was radiant with intelligence and pleasure. Her hair, braided by her own hands, was bound about a head, whose intellectual capacity and development were beautifully expressed in its graceful outline, and its broad open brow; her dress, arranged by herself, was a pattern of neatness and simplicity; the work she had knitted, lay beside her; her writing-book was on the desk she leaned upon.—From the mournful ruin of such bereavement, there had slowly risen up this gentle, tender, guileless, grateful hearted being. Like other inmates of that house, she had a green ribbon bound round her eyelids. A doll she had dressed lay near upon the ground. I took it up, and saw that she had made a green fillet such as she wore herself, and fastened it about its mimic eyes. She was seated in a little enclosure, made by school-desks and forms, writing her daily journal. But soon finishing this pursuit, she engaged in an animated conversation with a teacher who sat beside her. This was a favourite mistress with the poor pupil. If she could see the face of her fair instructress, she would not love her less, I am sure. I have extracted a few disjointed fragments of her history, from an account, written by that one man who has made her what she is. It is a very beautiful and touching narrative; and I wish I could present it entire. Her name is Laura Bridgman. ‘She was born in Hanover, New Hampshire, on the twenty-first of December, 1829. She is described as having been a very sprightly and pretty infant, with bright blue eyes. She was, however, so puny and feeble until she was a year and a half old, that her parents hardly hoped to rear her. She was subject to severe fits, which seemed to rack her frame almost beyond her power of endurance; and life was held by the feeblest tenure: but when a year and a half old, she seemed to rally; the dangerous symptoms subsided; and a twenty months old, she was perfectly well. ‘Then her mental powers, hitherto stinted in their growth, rapidly developed themselves; and during the four months of health which she enjoyed, she appears (making due allowance for a fond mother’s account) to have displayed a considerable degree of intelligence. ‘But suddenly she sickened again; her disease raged with great violence during five weeks, when her eyes and ears were inflamed, suppurated, and their contents were discharged. But though sight and hearing were gone for ever, the poor child’s sufferings were not ended. The fever raged during seven weeks; for five months she was kept in bed in a darkened room; it was a year before she could walk unsupported, and two years before she could sit up all day. It was now observed that her sense of smell was almost entirely destroyed; and, consequently, that her taste was much blunted. ‘It was not until four years of age that the poor child’s bodily health seemed restored, and she was able to enter upon her apprenticeship of life and the world. ‘But what a situation was hers! The darkness and the silence of the tomb were around her: no mother’s smile called forth her answering smile, no father’s voice taught her to imitate his sounds:--they, brothers and sisters, were but forms of matter which resisted her touch, but which differed not from the furniture of the house, save in warmth, and in the power of locomotion; and not even in these respects from the dog and the cat. The reader will scarcely need to be told, however, that the opportunities of communicating with her, were very, very limited; and that the moral effects of her wretched state soon began to appear. Those who cannot be enlightened by reason, can only be controlled by force; and this, coupled with her great privations, must soon have reduced her to a worse condition than that of the beasts that perish, but for timely and unhoped-for aid. ‘At this time, I was so fortunate as to hear of the child, and immediately hastened to Hanover to see her. I found her with a well-formed figure; a strongly marked, nervous-sanguine temperament; a large and beautifully shaped head; and the whole system in healthy action. The parents were easily induced to consent to her coming to Boston, and on the 4th of October, 1837, they brought her to the Institution. ‘For a while, she was much bewildered; and after waiting about two weeks, until she became acquainted with her new locality, and somewhat familiar with the inmates, the attempt was made to give her knowledge of arbitrary signs, by which she could interchange thoughts with others. ‘There was one of two ways to be adopted: either go on to build up a language of signs on the basis of the natural language which she had already commenced herself, or to teach her the purely arbitrary language in common use: that is, to give her a sign for every individual thing, or to give her a knowledge of letters by combination of which she might express her idea of the existence, and the mode and condition of existence, of any thing. The former would have been easy, but very ineffectual; the latter seemed very difficult, but, if accomplished, very effectual. I determined therefore to try the latter. ‘Then small detached labels, with the same words printed upon them, were put into her hands; and she soon observed that they were similar to the ones pasted upon the articles. She showed her perception of this similarity by laying the label k e y upon the key, and the label s p o o n upon the spoon. She was encouraged here by the natural sign of approbation, patting on the head. ‘Hitherto, the process had been mechanical, and the success about as great as teaching a very knowing dog a variety of tricks. The poor child had sat in mute amazement, and patiently imitated every thing her teacher did; but now the truth began to flash upon her: her intellect began to work: she perceived that here was a way by which she could herself make a up a sign of any thing that was in her own mind, and show it to another mind; and at once her countenance lighted up with a human expression: it was no longer a dog, or parrot: it was an immortal spirit eagerly seizing upon a new link of union with other spirits! I could almost fix upon the moment when this truth dawned upon her mind, and spread its light to her countenance; I saw that the great obstacle was overcome; and that henceforward nothing but patient and persevering, but plain and straightforward, efforts were to be used. Bridgman suffered from scarlet fever. In remarking on Bridgman’s “large and beautifully-shaped head” and her “nervous-sanguine temperament”, Howe is drawing on the nineteenth-century science of phrenology which held that the shape of one’s head was a guide to character. See John Van Whye, The History of Phrenology on the Web for more information. Dickens, Charles. American Notes for General Circulation. Ed. Patricia Ingham. New York: Penguin, 2000. Pages 39-44. Bourrier, Karen. “Reading Laura Bridgman: Literacy and Disability in Dickens’s American Notes.” Dickens Studies Annual 40 (Summer 2009): 37-60. Gitter, Elisabeth. 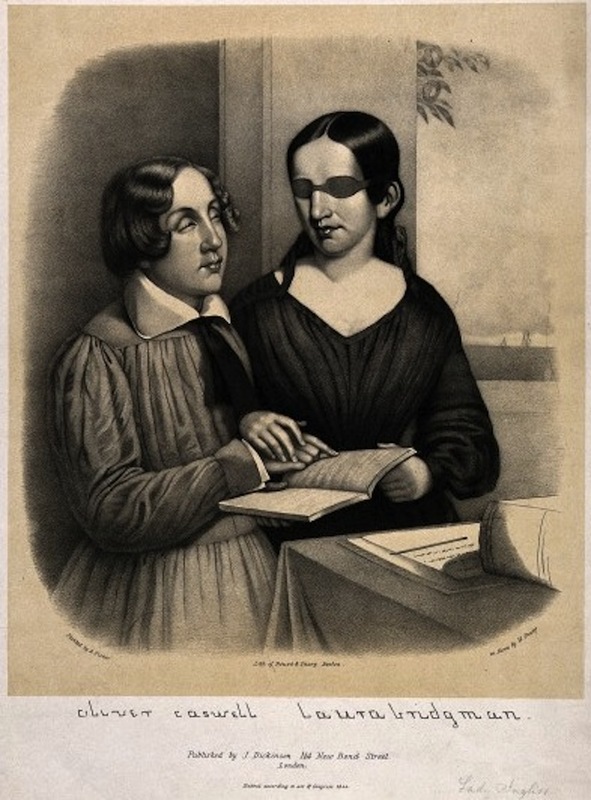 The Imprisoned Guest: Samuel Howe and Laura Bridgman, the Original Deaf-Blind Girl. New York: Farrar, Straus & Giroux, 2001. Freeberg, Ernest. The Education of Laura Bridgman: First Deaf and Blind Person to Learn Language. Cambridge: Harvard UP, 2001. Dickens, Charles, “American Notes,” Nineteenth-Century Disability: Cultures & Contexts, accessed April 23, 2019, http://nineteenthcenturydisability.org/items/show/2. Nineteenth-Century Disability: Cultures and Contexts, 2012-2015, is licensed under a Creative Commons Attribution-NonCommercial 3.0 Unported License. The project, directed by Karen Bourrier, has been funded by SSHRC and launched with the help of the Research Group for Electronic Textuality and Theory at Western University.